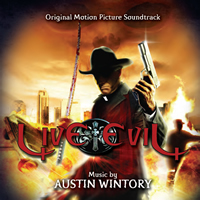 BUYSOUNDTRAX Records presents LIVE EVIL, featuring music composed by Austin Wintory for the 2009 horror film written and directed by Jay Woelfel, starring Tim Thomerson. Mark Hengst, Olsa Wallander, Tiffany Shepis and Ken Foree. LIVE EVIL tells the story of a quartet of bloodsucking vampires who are being chased across the country by Priest (Thomerson), a cowboy hat-wearing, samurai sword-wielding man of the Cloth, who is out for holy justice… or is it just revenge? This group of vampires, led by Benedict, are desperate to find pure blood human victims to sustain them as the world’s human blood stream has become so polluted because of drugs, alcohol, cigarettes, etc. that even a small amount is undrinkable. Priest kills any vampire in his path as he chases after Benedict and his friends, always leaving a playing card on their corpses with the words “Live Evil” written on them. For LIVE EVIL, the composer chose to write orchestral music, in a gothic style. At the center of the score is a gothic requiem. Collaborating with vocalist Lisbeth Scott, the requiem was prepared in traditional Latin, interspersed with German text from Bach’s Cantata 140. Also part of the score are some 80’s style Rock/Metal cues for the action scenes. Starting from a childhood obsession with the music of Jerry Goldsmith, Austin Wintory's passion for composing has led to a career spanning over 200 productions, encompassing films and video games, TV shows, commercials, shorts, podcasts, video art installations, and audio books. Austin has scored over twenty five feature films, including three released theatrically in the Us and Europe. Most notable was the 2009 Sundance hit GRACE, as well as the 2008 Sundance Audience Award winner CAPTAIN ABU RAED. His score for the former garnered many horror film genre accolades, including a nomination at the 2010 Fangoria Chainsaw Awards for 'Best Original Score,' and Vision in Sound's Top Ten Scores for 2009. The latter was listed by the LA Times as a contender for the 2009 Academy Awards for 'Best Original Score' and also won Austin the Hollywood Music Award for "Best New Composer." The combined success of those films, along with several others, prompted The Hollywood Reporter to list Austin as one of 15 composers "Primed to take their place on the A-list," as well as a nomination by the International Film Music Critics Association for "Breakout Composer of the Year." In addition to feature films, Austin has a tremendous passion for the world of game scoring. His first major game score FLOW in 2006 earned Austin a British Academy Award nomination and triple nominations at the Game Audio Network Guild awards ("Innovative use of Audio," "Best Interactive Score" and winning for "Rookie of the Year."). Austin also maintains a busy schedule writing concert music and composing/producing albums. In addition to more traditional chamber and orchestral music, in 2010 he released a meditation album entitled "Sounds of Darkness" using never-before recorded sacred Aztec chants. 2010 also saw the launch of Allogamy, an ambitious blog in collaboration with photographer Andrew Berglund which posts a new photo with a new piece of music for every single day in the year. Beyond composing, Austin is also a strong advocate for music in the schools, particularly in early education, and as such is a very active memeber on the Board of Directors for Education Through Music - Los Angeles (alongside composers John Debney, Christopher Young, Michael Giacchino, James Dooley and many other music, business and education professionals).